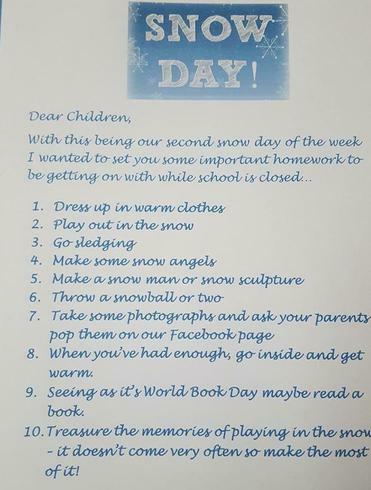 Please find a document for activities the children can be doing while at home today as it is a snow day. Feel free to share your activities on our Facebook page. Snow days are also a great time to practise your skills at home. There are lots of activities that you could be doing - here are a few ideas! Writing a diary about your adventures in the snow. Researching the coldest places on earth and writing a report on how the people and animals have adpated to life there. Reading your favourite books/ school reading book curled up with a blanket and a hot chocolate!). Building a snowman and bringing him to life in a story.